New York, Sept. 5, 2012 – From the comics page to the big screen, beloved cartoon character and comics icon Olive Oyl has done it all! Now, she is taking on the role of digital correspondent and covering some of the hottest events that Fashion’s Night Out (FNO) has to offer in New York City on Thurs., Sept. 6, 2012. In conjunction with Caravan Stylist Studio, Olive Oyl will be reporting on multiple events during Fashion Week in New York City. Caravan Stylist Studio is a full service studio for designers and celebrities seeking hair, makeup and wardrobe styling for parties, red carpet events, TV appearances and photo shoots. From Sept. 5 through Sept. 13, and all during Fashion’s Night Out on Sept. 6, Olive Oyl will be conversing with New York-based fashion designers via social media, encouraging the fashion community to register to vote and educating bloggers and influencers about the “Save The Garment Center” initiative, which is a project that is near and dear to Olive’s heart. Olive Oyl will assist Caravan Stylist Studio with their model casting for several highly anticipated shows and report on everything from the lead up to events to the red carpet scene. She may even dress some celebrities. Olive Oyl will, of course, be checking out and reporting on the fabulous outfits she sees along the way! 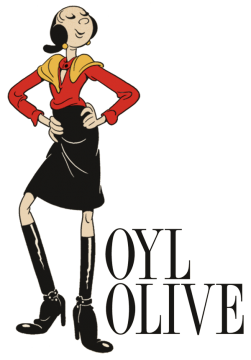 Fans can stay in touch with Olive Oyl in real time via Twitter, @OliveOylLoves and #FNO, and Facebook at http://www.facebook.com/oliveoylloves. She will also post updates on her official blog, http://www.oliveoylloves.com. There is no other character in comics history more capable of handling this full-access, behind-the-scenes Fashion Week assignment than Olive Oyl! Her bold attitude has made her an irresistible cult favorite among comics and cartoon character enthusiasts. In fact, Olive has appeared in close to 30,000 comic strips, more than 500 animated cartoons and innumerable comic books. Olive Oyl is represented by New York City-based King Features, a unit of Hearst Corporation. Fashion’s Night Out (FNO) is an unprecedented global initiative originally created in 2009 to celebrate fashion, restore consumer confidence and boost the industry’s economy during the recession. On Thursday, September 6, 2012, in response to overwhelming demand, Fashion’s Night Out will return to New York City and cities across the country to highlight fashion and support retail with exciting events that include designer appearances, celebrity guests, fashion shows and musical performances. Purchase items from the 2012 FNO collection and a portion of the proceeds will go to the New York City AIDS Fund in the NY Community Trust. In the United States, the program is a collaboration between American Vogue, the Council of Fashion Designers of America, NYC & Company and the City of New York. For more information, visit http://www.fashionsnightout.com/or FNO on Twitter at @fnonyc (#FNO). Caravan Stylist Studio is located in the heart of New York City’s Fashion District. Owned and operated by Claudine DeSolo, Caravan Stylist Studio is a full service studio for designers and celebrities seeking hair, makeup and wardrobe styling for parties, red carpet events, TV appearances and photo shoots. By offering ready-to-wear jewelry, handbags, evening attire, and shoes, Caravan Stylist Studio strives to create energy and excitement by having more people visit the Garment District and serve as a catalyst for conversations about new trends and upcoming designers. Save the Garment Center (STGC) is a trade association devoted to promoting New York’s Garment District, and the fashion companies or brands who use it. STGC promotes fashion companies and brands who design and produce quality clothing in the Garment District and in New York City. There are 24,000 apparel manufacturing jobs in New York City that make this domestic clothing production possible, and STGC creates transparent access to all of these resources for the future designers of America. As a trade association, STGC supports factories, suppliers, and designers through education and advocacy.